Extracting carbon dioxide, the inert greenhouse gas, from the atmosphere and using it as a fundamental material in the chemical industry has been the goal of researchers for a long time. Achieving this can help overcome two critical challenges at the same time: minimizing the reliance on oil and curbing drastic changes to the climate. Researchers from the University of Bonn are now working to make notable contributions in accomplishing this goal. They have found an innovative way to develop a highly reactive form of carbon dioxide by using laser pulses. The outcomes of the study have been reported online in advance and will be published soon in the printed version of the Angewandte Chemie journal. Each day, nature shows us the way to sophisticatedly extract carbon dioxide from the air and modify it into a greatly demanded raw material. Plants carry out photosynthesis by using their green leaves upon exposure to sunlight. Sugar (the much-needed nutrient and energy supplier) and oxygen are formed from water and carbon dioxide by tapping into the sunlight. “Scientists have been striving to mimic this model for a long time, for instance in order to use carbon dioxide for the chemical industry,” stated Professor Dr. Peter Vöhringer from the Institute for Physical and Theoretical Chemistry of the University of Bonn. The concept is difficult to implement because it is very challenging to make carbon dioxide to react and combine with other molecules. Working with his colleagues, the Dr. Peter Vöhringer has at present found out an innovative process by which a highly reactive variant of the hard-to-bind and inert greenhouse gas could be generated. The team used a so-called iron complex that consists of a positively charged iron atom positioned at the center, to which the components of the carbon dioxide are already attached multiple times. The team irradiated the iron complex by using ultrashort laser pulses of ultraviolet light, thereby breaking specific bonds. The ensuing product was a carbon dioxide radical, which also has the ability to form new bonds with a specific radicality. In such radicals, there is a single electron in the outer shell that hastily wants to get combined permanently to another atom or molecule. “It is this unpaired electron that distinguishes our reactive radical anion bound to the central iron atom from the inert carbon dioxide and makes it so promising for chemical processes,” elucidated Steffen Straub, lead author of the study, from Vöhringer’s group. Such radicals could consequentially be the building blocks of intriguing chemical products, for example, urea for chemical syntheses or methanol as a fuel and salicylic acid as a medication for treating pain. The researchers observed the behavior of the molecules by using their laser and infrared spectrometer, a large apparatus stationed in the basement of the institute. The spectrometer evaluated the attributive vibrations of the molecules, a “fingerprint” which enables them to recognize the bonds between disparate atoms. “The formation of the carbon dioxide radical within the iron complex changes the bonds between the atoms, which reduces the frequency of the characteristic carbon dioxide vibration,” elucidated Straub. 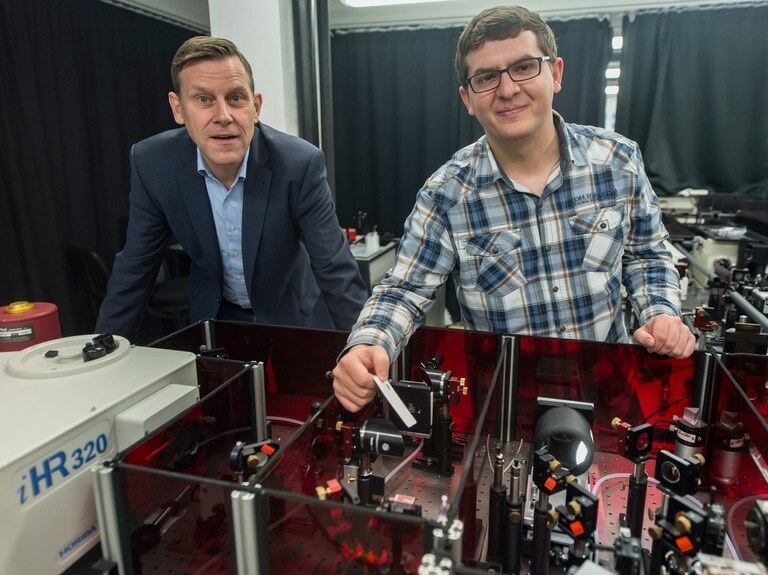 The researchers used their forensic instinct to validate that the laser pulses actually form the reactive carbon dioxide radical. Initially, the researchers used the computer to simulate the vibrational spectra of the molecules and then compared the computations with the measurements. Consequently, the experiment and the simulation matched really well. Similar to a “molecular motion picture”, the spectrometer captured “snapshots” at an incredible temporal resolution of one-millionths of one-billionth of a second. Based on the spectra, which are in accordance with the individual images of a film, the deformation of the iron complex under pulsed laser illumination over various different stages, breaking up of the bonds, and at last, the formation of the radical can thus be revealed, typically in slow motion. “Our findings have the potential to fundamentally change ideas about how to extract the greenhouse gas carbon dioxide from the atmosphere and use it to produce important chemical products,” stated Vöhringer. Despite this advancement, appropriate catalysts have to be created for industrial use as laser pulses are not effective for large-scale conversion. “Nonetheless, our results provide clues as to how such a catalyst would have to be designed,” further stated the researcher. The present work fits into the multidisciplinary, important profile areas of sustainability and matter research at the University of Bonn.